Open-plan office designs have been utilized for many years by companies and organizations across all spaces and industries. While every type of office plan comes with its own set of advantages and disadvantages, many of today’s most progressive companies have implemented open office furniture systems as a means of creating a more social work environment. 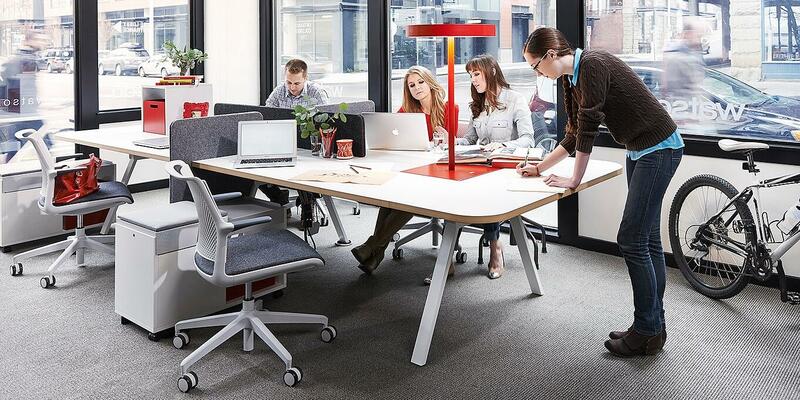 There’s no doubt that open office furniture systems are changing how modern professionals work in a multitude of different ways, and the effects have certainly been noticeable over the course of just the past decade—here are just a few examples. Collaboration between employees has long been a goal for upper management, yet it so often fails to occur in a productive manner. According to this infographic by the Queens University of Charlotte, nearly 40% of employees surveyed felt as if people within their organizations did not collaborate enough with one another. Open office furniture systems haven’t entirely solved the problem, but they’ve certainly helped by knocking down cubicle walls and creating a more social, connected work environment. 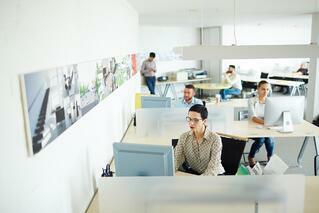 In shared environments, open plans make it easy for employees to work in different settings and groups. “Touchdown-style,” or “hoteling” environments in which deskspace is completely unassigned are particularly of note, as they allow for employees to come and go at their leisure without needing to maintain any sort of a “parked” desk area. Freestanding open office furniture systems offer the ultimate in flexibility as opposed to interlocked systems, making on-the-fly configuration something that employees can do on their own without having to put in a request. This frees up time and effort on the part of management as well, which can help to enhance productivity and keep costs down. In a survey conducted by Herman Miller, 500 polled employees rated “having an office that is comfortable to work in” as the most important of 27 workstation attributes. At the end of the day, it’s illogical to think that a “one size fits all” solution for office furniture could ever work. All employees are built differently, and some will no doubt have certain needs that must be fulfilled. Take chair height, for example, which can truly affect a person’s health and wellness over time if not properly calibrated. Many people who work for larger organizations spend weeks if not months waiting for requests for augmentation of their office furniture to be fulfilled, which can easily affect their productivity and general mood in the meantime. Open office furniture systems remove this barrier by providing a degree of freedom unavailable in traditional office environments. Freestanding furniture systems in particular let people adjust their workstations to meet their own individual needs. This is especially useful for when teams shift around the office for periods of time, as workstations can be adjusted back and forth with ease. In the case of projects that last only a few days, for example, freestanding furniture systems allow for simple shifts back and forth that might otherwise require lengthy requests and assistance from management. Many companies still view this type of reconfiguration flexibility as a rather large expense, incurring time and energy whenever product launches, holiday promotions or other events call for quick re-creation of a space. In the past, these and similar tasks would take people away from the work they’re supposed to be doing and cost companies valuable resources, often resulting in problems that took many weeks or months to remedy. Open office furniture systems take stress out of the equation so that each team member can focus on the task at hand without distraction. No matter how large or small a company or organization is, it can be exceedingly easy for employees to operate in a silo. This is especially true in the case that one’s specific role doesn’t require much outright collaboration with colleagues, if any. Add to this a cubicle-type office environment, and a perfect storm emerges, where employee engagement levels are bound to fall. According to Gallup, which has been tracking employee engagement rates in the United States since 2000, only 32% of American employees identify as being engaged with their work, and the numbers haven’t moved for quite some time. While some workers thrive on privacy and benefit from a closed environment, open office furniture systems are just what certain people need to feel more in touch with their colleagues and the work in front of them. The inevitable increase in socialization between employees that occurs when the walls come down leads to an enhanced company culture—something that thought leaders and managers seek to move towards all the time. With open office furniture systems continuing to modulate and offer more flexibility in outfitting modern offices, countless small shifts have occurred in addition to those mentioned above. Open plans, coupled with an increase in remote work have made it so that people are less likely to be “at their desk” at any given time than ever before. This has caused a shift in effectiveness of traditional management styles, placing more trust and responsibility on the part of the employee along with added freedom and flexibility. Work-life balance is trickier now than ever given today’s technology, and open office furniture systems have given rise to a shift in how employees—especially millennials—view the office as a whole. Some prefer to spend as much time in the office collaborating with their colleagues as possible, while others may choose to work from home or a coffee shop due to responsibilities outside of work that can’t be ignored. In some ways, open office furniture systems have served as a catalyst for a more modern approach to balancing work and life, allowing for employees to have more control over where they are or need to be at any given time. Open-plan offices certainly have their detractors (mainly those who require excessive amounts of privacy while working), but the overall shift towards a more free, casual come-and-go work environment certainly does not seem like a trend bound for disappearance.